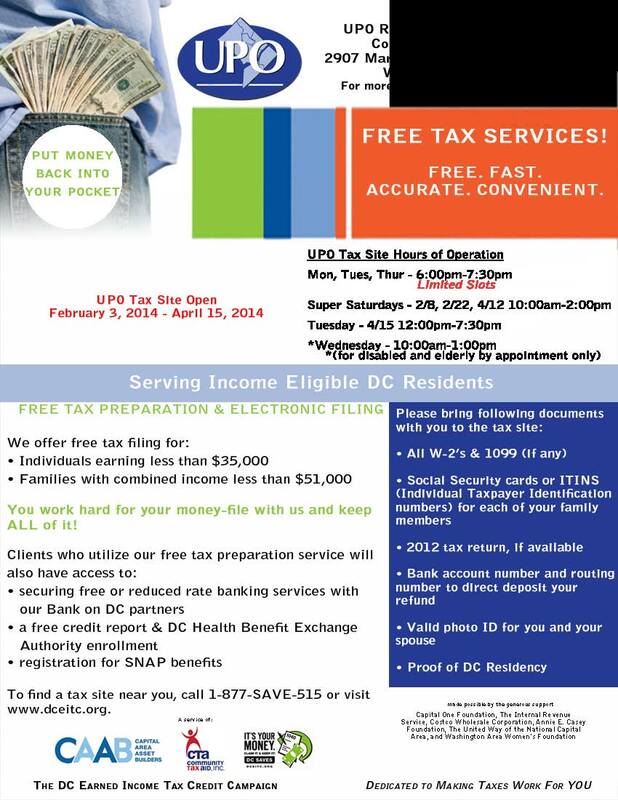 The office of Congresswoman Eleanor Holmes Norton (D-DC) today announced that a press conference will kick off Norton’s annual free Tax and Financial Services Fair on Saturday, February 15, 2014, at 10 a.m., at the Walter E. Washington Convention Center (801 Mt. Vernon Place NW). The Tax and Financial Services Fair will run from 10:00 a.m. until noon. The speakers at the press conference, in addition to Norton, will be announced shortly. Norton will address the status of several of her D.C. tax initiatives, such as the $5,000 first-time homebuyer tax credit, which she has introduced a bill to revive, and her bill to offer employers a $5,000 tax credit against the payroll tax liability for each new net person hired who has been unemployed for 27 weeks, which would encourage employers to look twice at the long-term unemployed. The Tax and Financial Services Fair is for D.C. residents only, and preparation of tax forms is only available to residents with a household income of less than $52,000 a year and income only from wages, salaries, and pensions. Norton’s one-day Fair features tax preparers who serve on Norton’s Congressional Tax and Financial Services Advisory Committee, whose services are available throughout tax season, until April 15. The Fair offers not only tax preparation, but also financial services, including information on the D.C. Tuition Assistance Grant Program, college savings plans, and how to sign-up for credit unions. Members of the Tax and Financial Services Advisory Committee participating in the Fair are: AARP, Community Tax Aid/DC EITC Campaign DC EITC Campaign, DC Employees Federal Credit Union, DC Office of Tax & Revenue, George Washington University Law School, Howard University, Janet R. Spragans Federal Tax Clinic, Taxpayer Advocate Service, UDC School of Business, UDC Low Income Tax Clinic. A major goal of Norton and the Tax and Financial Services Advisory Committee is to promote and popularize the neighborhood tax preparation sites to better acquaint residents with free tax preparers in their own neighborhoods, which operate throughout tax season. Residents who are unable to come to Norton’s one-day Fair often will find free tax services near where they live.